This is a beautifully maintained wildlife park where you can experience the best of native New Zealand. Freshwater spring and Treetops Walk. Visitors can interact with a variety of wildlife that is found wild around New Zealand. Animals such as Deer, Pigs, Thar and Wallabies may be hand fed. Lion feeding 2:30 pm every day. This is a privately owned family business, set amongst stunning native New Zealand bush. Wander along the accessible walkways at your own pace, feeding the wildlife. 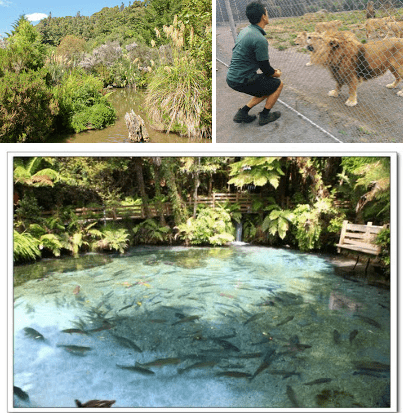 Paradise Valley Springs Wildlife Park is situated just 10 minutes' drive from central Rotorua. It is an all-weather attraction, suitable for all age groups. 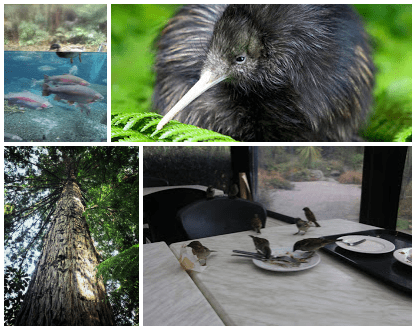 Set amongst the native trees and beautiful forests of Rotorua, Rainbow Springs Nature Park offers a fun-packed and educational experience for the whole family. Learn about New Zealand’s fascinating natural history and come closer than ever to the creatures who call this great land of ours home. The fun never stops at Rainbow Springs with our impressive playground area, the thrilling Big Splash water ride and ever popular Bird Show.